Microblading is manual skill of semipermament eyebrown drawing. Shape of the eyebrows is calculated according to golden intersection and face morphology. The pigment is applied into the surface of the dermis using sterilized tools. The pigment is chosen to match the natural hair color. After the healing the color may become several hues lighter than the natural hair color. Symetry is achieved through PhiBrows application and its calculated while the clients eye is closed because in that way the mimitic muscles that can affect the symmetry are relaxed. Strokes are always drawn in direction of natural hair grow to achieve the hyper realistic look. When client has very few natural hairs, manual technique is combined with the machine in order to get shadows that improve the volume. The combination of both technique is called PhiPhusion. Treatment is perfomed with disposable sterile tools and pigments are produced in accordance with the highest standards. Correction is done a month after the first treatment because between 10 and 15% of drawn strokes disappear after the first treatment. Color is extremely dark in first 7 days and 7 days later it loses 50% of its intensity. If you think the color is too dark do NOT try to remove it by yourself by any means. Patiently wait 7 days so the color fade on its own after the healing of the skin. Color duration depend how oily the skin is. The oiler the skin the shorter color last. Sweating and sun exposure can reduce color fastness. Average, expected time until color refreshment is 10-12 months. With oily skin up to 6 months. The healing is fully completed after 28 days and this is when we perfom an obligatory addition of the pigment that has been lost. With problematic and oily skins we can have several additions. Post treatment flow makes 70% of the treatment’s success. Consequently obey advice because if you don’t do so you may lose up to 80% of drawn strokes. Rinsing and applying creams is of great importance. The threading is a method which has an history of over 6,000 years. It is unknown where threading originated first, Central Asia or India. According to one theory, the practice started in India over 6000 years ago and spread throughout Asia, the Middle East, and in recent times Europe. 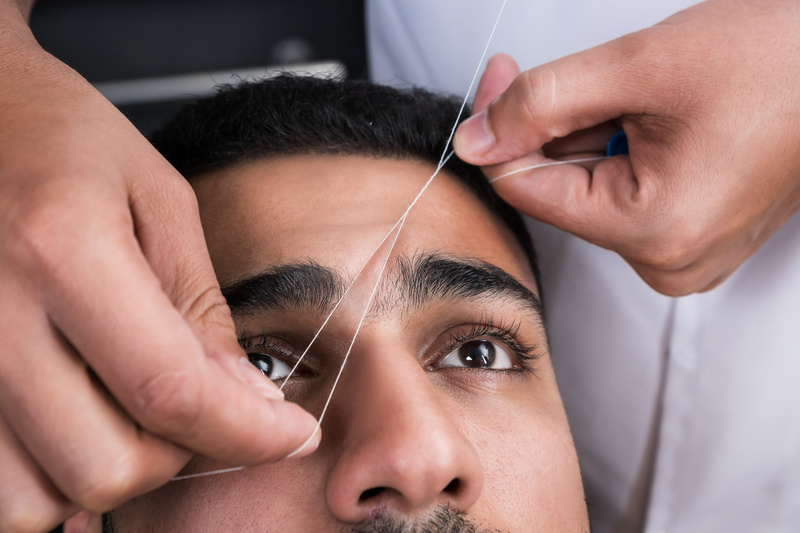 Threading for eyebrows and facial hairs is widely practiced in Asia , Central Asia and the Middle East. Threading is kinder to the skin then waxing as no heat or chemicals are applied to the skin during the treatment. Shaping /grooming eyebrows with threading enhances facial features. Is Threading for everyone ? Yes. As threading is kinder to the skin, even those with very sensitive skin which often cannot be waxed, can have a threading treatment. Individuals using Roaccutane or with very sensitive skin are advised not to have the full face procedure the first time. The initial treatment takes 3 hours.